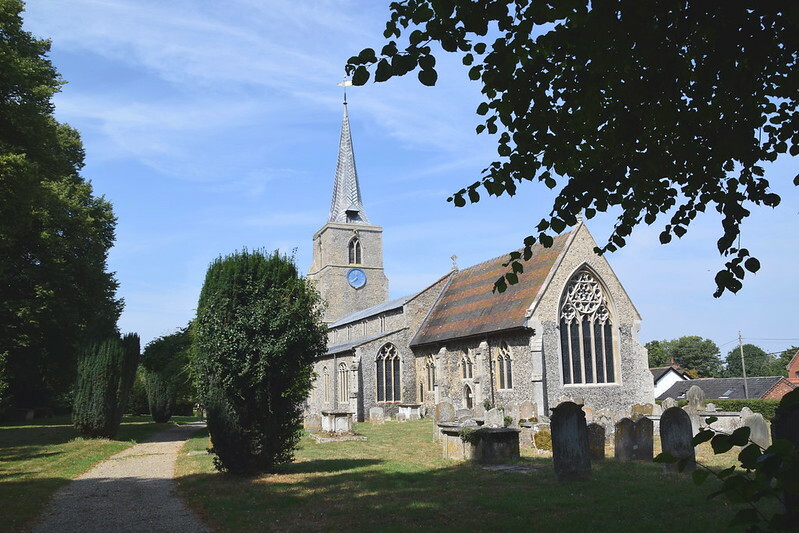 A large, prosperous south Norfolk village, fat and sleepy like an old cat on this day of high heat in August 2018, and the famous view of its parish church of St Mary is from the green - the village sign, the war memorial, and then that magnificent spire lifting to heaven. It rises more than 40 metres, and is made of ribbed lead, very similar to the one over the border at Hadleigh in Suffolk. 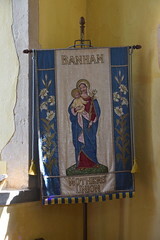 It had been a long time since I last visited Banham church, long enough ago for its size and presence to have surprised me. The building is pretty much all of a piece, early 14th century. 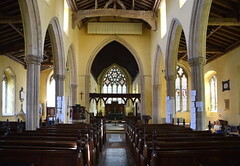 The Victorians brought the east window, which Sam Mortlock thought somewhat excessive in its exuberance, but the wealth of flowing tracery elsewhere in the church holds up well against it. You step into a large, well-kept jewel. Although, inevitably, there was a massive Victorian restoration here, there is still a feeling of simplicity, with brick floors and slightly cluttered furnishings, all overshadowed by a magnificent west end organ. High above, the roof bears the date 1622, and the little George III royal arms look like a postage stamp above the high tower arch. The star of the show is the luscious range of 19th and early 20th Century glass, much of it the work of Powell & Sons. 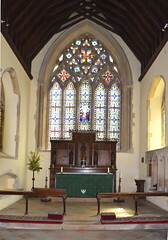 The 1857 east window, unusually, is a cavalcade of geometric designs in pressed glass, with at its centre a crucifixion. The artist was John Clayton, a vigorous scene, his watchers looking up in an agony, showing what he was capable of before Alfred Bell came along and made him serious. It is reminiscent of the work of Robert Bayne in the same decade. The other 19th Century Powell & Sons glass is to the designs of the great Henry Holiday. 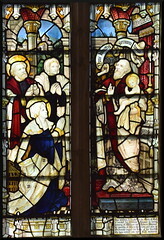 The earliest echoes the style of the east window, with medallions of the Baptism of Christ, the Adoration of the angels at the Nativity, and the Ascension of Christ. The best, in the south aisle, depicts gorgeously rich figures of the four Evangelists, each in their own light over two windows. 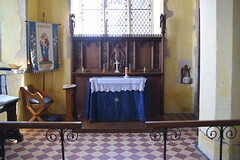 The richness of these was echoed half a century later by a Powell & Sons window of 1936, which is probably the freshest and most memorable thing in the whole church. 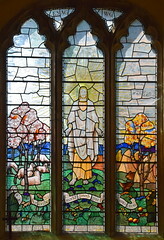 The risen Christ stands between two lights, one depicting spring with sheep grazing beneath an apple tree in blossom, the other autumn with the tree in fruit above rabbits and birds. It would be interesting to know who the artist was. The window beside it of the Presentation in the Temple is by Kempe & Co, and seems curiously out of place as if simply not speaking the same language, but then I've never been a fan of Kempe glass. 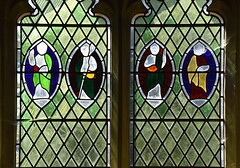 The earliest English glass is in the chancel, a range of the twelve disciples and a Tudor arms all in a pre-Ecclesiological style. It probably dates from the 1830s, and has not worn well, the painted details have long since faded and all that remains are mosaics of coloured glass suggesting human figures. 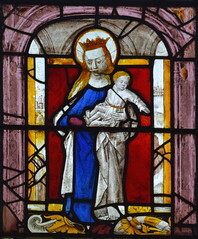 However, there is a very good 16th Century continental image of the Blessed Virgin and child in the north aisle, collected from elsewhere and set here in the 1960s. 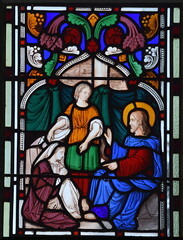 In the east window of that aisle is a single 19th Century panel depicting Christ with Martha and Mary at Bethany, which seems so odd to find in isolation that I think it may too have come from elsewhere. 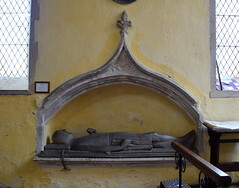 At the east end of this aisle lies a wooden knight, life-size and rather severe in his simplicity inside his tomb recess. 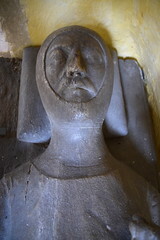 He is popularly believed to be Sir Hugh Bardolph, founder of the church, but as Pevsner drily notes, given that Bardolph died in 1203 and this effigy is early 14th Century, it is a bit too much of an afterthought. 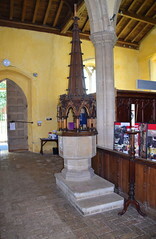 Woodwork of a later time surmounts the font on its stepped pedestal, a grand gothic font cover of the 1860s that might take its inspiration from the Albert Memorial. 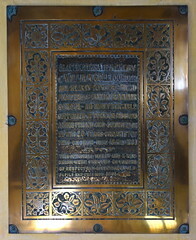 The screen came next, and by the end of the century the two richly carved reredoses in the sanctuary and the north aisle chapel. On this day of bright sunshine on a day in high summer, the temperature dipping up into the thirties, this felt a proud, confident place, a real statement of 14th Century confidence coupled with 19th Century piety and energy. But I remembered being here once before, some fifteen years ago, late on a December afternoon. 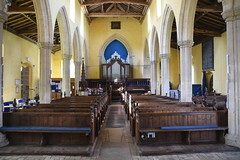 The low sun made the shadows long, and inside the church the south aisle windows glowed as if they were on fire as the nave and chancel darkened. And as I sat there, the day faded. I could hardly see the settings on my camera any more, but Christ in the apple orchard still glowed fiercely, the brightest of the jewels, as if on its own holding back the sinking sun. And then, as the afternoon deepened, the windows around darkened, like stars fading, and this was the last to go out.